Dennine Leschinsky, Eyer Middle School Literacy Coach and Debi Zosky, East Penn School District presented a session on Literature Circles at the Secondary Level at LCTIs Teaching and Learning in Today’s World: Lessons from The Field. Dennine and Debi graciously shared their resources that I uploaded to share with you. Debi began with a warm up session: your name, position, and defining moment in your life or career. The warm-up worked, because I discovered things about my colleagues attending that I did not know, and perhaps should have. Then we selected a symbol that represented us, and we placed it on a post-it, identifying on a continuum of 1 to 4 our level of experience. Almost all of us were at 1, rank beginners, and that fit my comfort zone. You can customize to meet your needs, but our presenters suggest no more than 4-5 students with roles in a group because it overwhelms the participants and defeats the purpose of the circle. Dennine shared a video of a class engaged in a literature circle consisting of 4 students in 6th grade. Students shared their jobs within the circle. This group had Discussion Director, and her job was to keep the group on task and the dialogue flowing using questions and answers. The team had an Illustrator, and I must say I was impressed with how much information was gleaned by the student about the book through the medium of art. The Connector took his own life and connected the text to self. The students were very collaborative and each contributed to the commenting process. The Wordsmith directed his group to a specific vocabulary word and asked the students to make connections to the language and situation in the book. The team was organized and logically progressed through a purposeful agenda which was open yet structured. While we viewed the four-minute video, we completed the “Outer Circle Observations of Literature Circles” graphic organizer for the fishbowl strategy. I liked this learn-by-doing approach, because it was clear what our expectations were and we saw the process from the student perspective. When you are grading, you are looking for behaviors, participation, and engagement. You have the option to assess or not, but what I found invaluable was how this process taught behaviors and kept students actively on task. It also aids us to help students become adults with understanding of life-like roles with developing skills for 21st century skills. Beyond the content, you are really teaching skill sets for students with critical thinking skills. This approach really does align seamlessly with SAS standards. To make literature circles work, you need to teach behaviors with a set of expectations. Beginning with respect, you need to develop a system for keeping students on task. A good way to do that is to give them very little time to get the task completed by creating some old-fashioned tension generated by time limits. Limits with a timer that shaves some time from the assignment is a good tool. You can let the students work “one more minute,” and in that minute they really work toward completion. Give them a time frame. Good idea is to give them a countdown for expectations with an agenda. Students must come prepared for the assignment, and if you know they won’t honor the time frame because they are social rather than academic, set students off to the side and let them prep so they can ultimately join the group. Move them with grace and dignity, so you don’t ruin the groups or your day. The final item is identifying Best Practices. Student discussion, critical thinking, reciprocal teaching, paraphrasing, cooperative learning are among the many best practices that emerge. In 1984, Palinesar and Brown developed reciprocal reading. In 1994, Harvey Daniels created discussion groups with 4-5 students. In 2004, Kelly Gallagher made skills visual and roles should be the least restrictive. Presently, College Board developed SOAPS (Subjects, Occasion, Audience, Purpose, Speaker). All of these approaches, given that you implement them for the first several months of school, enable students to switch roles and assume any of them within a literature circle. Yet another way to organize a literature circle is to give each student in the group the responsibility to do one task for all of the group’s roles. 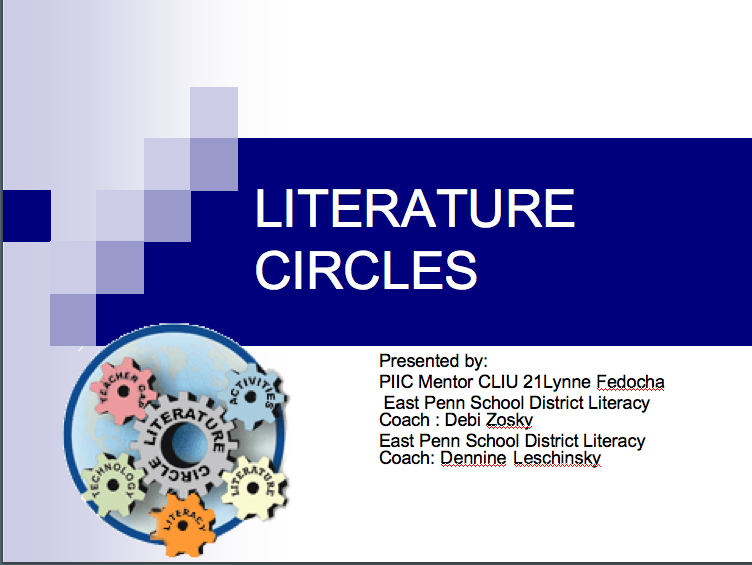 We were then given an interesting article, “Textmasters: Bringing Literature Circles to Textbook Reading Across the Curriculum” from Journal of Adolescent & Adult Literacy (Oct. 09). For school districts moving to block scheduling like ours in a year, the Textmasters’ approach is an interesting and workable concept, because the time frame for the tasks work on a 20-20-10 minute cycle for roles and incorporate technology integration in the process. My favorite handout was the Question Matrix from Chuck Weiderhold’s “Creative Learning and Thinking.” This matrix taps into Academic Literacy or Reading Apprenticeship strategies for questioning, only it steps it up and I believe makes the QAR even better. Our final handout was a print copy of an online article, “Going Green: Recycling Bottles into Soccer Shirts,” and is a great example of an engaging text for literature circles. Great suggestion was reading selections is tapping into current events. This article is about World Cup soccer shirts made of glass. OK, I’m in. Our final activity was to chart our growth with “four corners.” As a result of this presentation, are you on the “Dirt Road” (what are your questions); “Paved Road” (not a beginner, but still have some questions); “Highway” (speeding ahead and great comfort road); and “Yellow Brick Road” (you are the expert and are good to go). The last word: our presenters reminded us that we should manipulate what we’ve learned to work for us. We have a framework, but it is open and flexible. Now it’s up to us to put our own signature on it.